This winsome little skipper was first described by Fabricius in 1787 from a southeastern United States specimen; he named it Papilio taumas. The description and name themistocles, bestowed by the well-known French entomologist Pierre Andre Latreille, were later given precedence. The type specimen from Latreille’s collection is thought to be in the Musée Nationale d’Histoire Naturelle in Paris (Miller and Brown 1981: 38). Boisduval and LeConte coined yet another name, Hesperia cernes, in their 1834 treatise, probably basing their description on a drawing by John Abbot. Thaddeus W. Harris was the first to report this species in Massachusetts. In a passage undoubtedly written about 1840, but not published until the posthumous 1862 edition of his work, he refers to a specimen he called Hesperia ahaton, saying “It was captured many years ago in Milton, and I have given it the name of an Indian from that vicinity” (Harris 1862: 318, Fig 140). Harris' Index gives the date of the specimen as 1831. The Native American to whom he refers remains a mystery. Samuel Scudder was quite familiar with Tawny-edged Skipper. and called it common. “In New England, as might be expected, it is everywhere common, from the White Mountains, and even from the highest peaks of the same, to the southern and eastern sea coast (1889: 1729).” This does not mean that Tawny-edged was abundant; the only two skippers that Scudder describes as “abundant” in New England in 1899 are the Least Skipper and Peck’s Skipper. Still, Tawny-edged was so common that Scudder does not give the usual list of specimens or collection locations. However, F. H. Sprague easily collected many specimens in Wollaston (Quincy) in June 1878, and in Belchertown in July and North Leverett in August that year (Sprague 1879). For eastern Massachusetts, the Harvard MCZ has many 1878-1895 Sprague specimens from Wollaston, West Roxbury and Malden, two 1880 specimens from South Abington (Plymouth Co.), and early undated specimens from Brookline and Milton. For the Connecticut River valley region, there are Sprague specimens from Amherst (1885, 1886), Belchertown (1885), Deerfield (1885), Montague (1885), Palmer (1885) and South Hadley (1885). Nineteenth-century Newton naturalist C. J. Maynard (1886) also called Tawny-edged “a very common Skipper.” It was probably more common than the closely-related Crossline Skipper. As with many of the upland skippers, Tawny-edged Skipper's numbers probably increased with the spread of agriculture after 1600 (Table 1). By 1934, Farquhar still follows Scudder in describing Tawny-edged as "common everywhere in New England;" but he gives no list of specimens. The islands appear to be an exception: Jones and Kimball (1943) do not list Tawny-edged Skipper as present on Nantucket, and mention it as only "occasional" for Martha's Vineyard. But for the mainland the MCZ has specimens from Harwich (1924) and Weston (1918), and from the 1950's there are specimens from Barnstable (6/1/51 and 9/5/52, C. P. Kimball, MCZ), as well as Fall River (5/25/1951, W. P. Rogers), Milton Blue Hills (6/21/1948, D. T. McCabe), and Wellesley, Amherst and Acton, at Yale Peabody Museum. In 1964 it was collected in Holyoke in the vicinity of Mt. Tom by J. M. Burns (MCZ). In the 1970's it was documented from Berkshire Co. (Becket, 7/20/1972, 7/9/1974, L. F. Gall, Yale), and from Worcester Co. (Barre, 7/8/1972, W. D. Winter, MCZ), and in the 1980's from Franklin Co. (Heath, 7/6/1982, S. D. Coe, Yale). Tawny-edged is probably less common today than a century ago, due to the loss of open meadow areas as pre-industrial agriculture declined in New England after 1850 (Table 2). Rick Cech makes this point well, writing that the reversion of open areas to woodlands, the loss of meadows to development, and the use of environmental chemicals may all have combined to make the Tawny-edged much less abundant in the northeast today than at the turn of the century (2005: 279). But unlike Peck’s Skipper, Tawny-edged Skipper is “not especially tolerant of heavy disturbance” (Cech 2005: 279); that is to say, it will not likely be found in recently plowed fields, frequently mowed areas, or manicured grounds and golf courses. The Connecticut Atlas found an egg or larva of Tawny-edged in the wild on both Kentucky bluegrass (Poa pratensis) and little bluestem (Schizachyrium scoparium). It is also known to use other grasses, mainly various Panicum spp. and slender crabgrass (Digitaria filiformis) (Scott 1986). Forbes, writing of New York state, (1960: 96) says that it "prefers Panicum." All these grasses except Kentucky bluegrass are native in Massachusetts, and all are common. 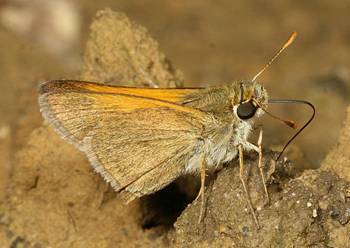 As with Peck’s Skipper, the adoption of the widespread introduced Kentucky bluegrass goes far toward explaining this skipper’s relative success, although it is still not as abundant as Peck’s Skipper, which also uses Kentucky bluegrass. Tawny-edged is among those butterflies which have adopted new non-native host plants (Table 3). The Tawny-edged may have one of the widest ranges of any meadow skipper. It extends from Nova Scotia across Canada to southern British Colombia, occurs in most of midwestern United States, and the whole of eastern United States south to the Gulf coast and part of Florida. It is apparently rarer in the southern part of its range. Its particular host grass and preferred habitat undoubtedly differ in these widely differing locales, and a focus on local research is needed. MBC records 2000-2007 rank Tawny-edged Skipper as Uncommon-to-Common (Table 5). It has been seen more often than Crossline Skipper, about as frequently as Long Dash and Northern Broken-Dash, but not as frequently as Least or Peck’s Skippers. It is not “Common” in the same sense as Peck’s or Silver-spotted Skippers are. The Atlas called Tawny-edged “common to locally abundant,” but in fact it was found in only 78 of 723 blocs searched, which would rank it as “Uncommon” (Table 5). And it is hardly ever "abundant" at any one location. The trend shown in Chart 93 is a small increase over this time period in numbers of sightings per total trip reports, although there are strong year-to-year fluctuations. A different methodology, list-length analysis, applied to MBC data 1992-2010, similarly showed a statistically significant increase of 44.9% in detectibility for this species over this time period (Breed et al. 2012). This upward drift contrasts with the flat or declining trend found for Crossline Skipper. Tawny-edged is one of several grass skippers to show an upward trend over this time period. Sightings per total trip reports show an upward trend for Least, Northern Broken-Dash, Little Glassywing, and Dusted Skippers, while list-length analysis shows an upward trend for Little Glassywing and Dusted. These contrast with the clear downward trends for the Hesperias Leonard, Cobweb and Indian, and for Hobomok. Tawny-edged is distributed throughout the state according to BOM-MBC records (Map 93), even including Nantucket, for which there is one report from the island of Tuckernuck (1 on 7/2/2011, M. Pelikan. BOM- MBC has 1992-2013 records from 153 out of a possible 351 towns. These records fill in some spaces that were empty on the 1986-90 Atlas map. The species has been reported at least once from all of the NABA Counts around the state. It is usually reported in varying numbers from the Northern, Central and Southern Berkshire Counts; from the Central Franklin (nearly every year), Northampton, and Lower Pioneer Counts; from Northern Worcester and Blackstone Valley, and from all the eastern Massachusetts counts, including Cape Cod and Martha’s Vineyard. Tawny-edged Skipper may have increased on Martha's Vineyard since the 1930's; Jones and Kimball (1943) reported it as only "occasional" on that island, and there appear to be no museum specimens. Today, the Vineyard checklist (Pelikan 2002) ranks Tawny-edged as “Common." On Cape Cod, Mello and Hanson (2004) say it “regularly occurs," and BOM-MBC has many Cape Cod reports. For Nantucket, there appear to be no specimens in the Maria Mitchell Museum, or other museums, and Jones and Kimball did not report it from the 1940's, but local observers think that it probably will be found, especially given the 2011 report from Tuckernuck (LoPresti 2011). Tawny-edged was not found on a 2001 survey of the Boston Harbor Islands, except at World’s End peninsula in Hingham, although many other skippers were on the islands (Mello 2002). However, it has been found on the Elizabeth Islands – on Nashawena on June 3, 1988 and on Naushon July 28 and Aug 11, 1988 (Mello 1988). In Berkshire County, Tawny-edged Skipper has been scarce. Reports since the early '80s from the NABA counts are small but consistent. Significant recent reports come from New Marlborough, 2 on 7/8/2011 B. Benner; Sheffield Bartholomew's Cobble, 4 on 6/8/2005 E. Barry; Pittsfield, 3 on 7/13/2013, B. Benner and J. Wicinski; Mount Greylock, 1 at Headquarters on 7/13/2013, T. Armata; Windsor Moran WMA, 1 on 7/9/2011 B. Benner; and Williamstown (see below). Tawny-edged is not usually found in large aggregations, though numbers can build up by late summer. Even at some well-scoured and usually productive locations, such as Broad Meadow Brook in Worcester or Great Blue Hill in Canton, observers have found only a maximum of 5 on any one day. On the other hand, the skipper sometimes turns up at unexpected spots, like Boston Nature Center in Boston. Counts from “around the town” can run into double digits. Barnstable Marstons Mills Airport 15 on 7/31/2010 A. Robb et al; Boston Boston Nature Center, 4 on 7/16/2006 A. Birch; Canton Great Blue Hill, 5 on 6/13/2004 E. Nielsen; Canton Brookwood Farm, 5 on 8/22/2009 S. Jaffe; Chilmark Fulling Mill Brook, 6 on 8/26/2003 M. Pelikan; Dover Elm Bank, 8 on 9/13/2012 B. Bowker and L. Stillwell; East Longmeadow Parker yard, 10 on 7/31/2010, K. Parker; Easthampton Arcadia WS, 4 on 6/19/2004 B. Benner; Edgartown Watcha Path, 5 on 6/16/2003; Grafton Dauphinais Park, 6 on 6/9/2012 D. Price et al. ; Hampden Laughing Brook WS, 11 on 8/17/2002 K. Parker; Longmeadow Fannie Stebbins WS, 20 on 8/7/1999 T. Dodd; Marshfield Daniel Webster WS, 5 on 8/28/2000 D. Furbish; Milford power line, 6 on 8/5/2002 E. Nielsen; Monson Norcross WS, 5 on 6/13/2006 J. Ohop and E. Barry; New Ashford Mt. Greylock, 3 on 7/10/2005, M. Lynch and S. Carroll; Newbury Spencer-Pierce-Little Farm, 6 on 7/29/2008 B. Zaremba; Newburyport Maudslay SP, 9 on 8/13/2011 B. Zaremba; Northampton community gardens, 35 on 8/5/2005 B. Benner; Oak Bluffs Trade Winds, 9 on 6/1/2002 M. Pelikan; Sandwich Mass. Military Res., 4 on 7/16/2011 E. Nielsen and P. Trimble; Sharon Moose Hill Farm TTOR, 14 on 5/31/2010 E Nielsen; Sheffield Bartholomew's Cobble TTOR, 4 on 6/8/2005 E. Barry; Sherborn power line, 3 on 6/8/2009 B. Bowker; Springfield Forest Park, 4 on 8/11/2002 T. Gagnon, K Parker; Topsfield Ipswich River WS, 7 on 8/25/2002 F. Goodwin; Upton Chestnut St. Gas Line, 6 on 6/13/1999 T. and C. Dodd; Wenham Wenham Canal, 7 on 8/17/1999 F. Goodwin; West Tisbury Wompesket, 17 on 8/7/2008 M. Pelikan; Westborough WMA, 4 on 6/13/2008 W. Miller and E. Barry; Williamstown Mountain Meadow, 2 on 8/26/2011 B. Zaremba et. al. ; and Worcester Broad Meadow Brook WS, 5 on 6/6/2003 D. Price and B. Walker. According to MBC 1993-2008 records, Tawny-edged adults are seen from mid-May through the third week in September, with occasional stragglers into October (http://www.naba.org/chapters/nabambc/flight-dates-chart.asp). Peak numbers are seen from 4th week in May through 2nd week in June, and again from 4th week in July through 3rd week in August, indicating at least two broods. But statewide there is not a sharp break between broods, and the skipper seems to be always flying somewhere throughout the season. This skipper is bivoltine through most of its range, except the far north. Mello and Hanson (2004) say that a lack of August records on Cape Cod means it is single-brooded there, or has only a partial second brood in some years. However, there are now several August reports from the Cape, for example, 9 on 8/23/1997 Bourne, A. Robb, and 2 on 8/23/2011, Sandwich, J. Dwelly. Earliest sightings: In the 23 years of BOM-MBC records 1991-2013, the six earliest "first sightings" are 5/7/2012 Upton Dodd yard, T. Dodd; 5/14/2010 East Longmeadow Parker yard, K. Parker; 5/16/2004 Amherst, T. Gagnon; 5/16/2002 Holliston, R. Hildreth; 5/16/1999 E. Longmeadow, K. Parker; and 5/18/2000 E. Longmeadow, K. Parker. The influence of the very warm springs in 2012 and 2010 can be seen here. The second sighting in the year 2012 was also an early record, 5/12/2012 Plymouth Tidmarsh Farms, M. Faherty (photo; female). All these sightings are earlier than the Atlas early date, which was 5/25/1986 S. Hadley, T. Fowler. There may be a trend toward earlier spring emergence and later fall flight compared to a century ago. In 1889 Scudder wrote of Tawny-edged Skipper that “The first generation makes its appearance in Massachusetts during the last week in May, usually between the 20th and 25th. In a week it becomes abundant, and by the middle of June most specimens are badly rubbed; a week later it begins to diminish rapidly, and yet a few specimens may often be found throughout July. (1889: 1730). In the 23 years between 1991 and 2013, there are six years (listed above) in which the first sighting of Tawny-edged was earlier than Scudder’s date of May 20. But in another eight of the years, the first sighting was between 5/20 and 5/25, in accordance with Scudder's dates. So there may be a slight trend toward earlier onset of the Tawny-edged flight. Latest sightings: In the same 23 years, the six latest "last sightings" are 10/14/2013 Walpole Adams Farm, M. Champagne; 10/12/2004 Northampton community gardens, T. Gagnon; 10/11/2010 (2 sightings) Edgartown Katama M. Pelikan and Dartmouth Allens Pond B. Bowker; 10/8/2011, Attleboro, M. Champagne; 10/5/2012 Dartmouth, L. Miller-Donnelly; and 10/5/2002 Wayland community gardens, S. Moore/B. Volkle/E. Nielsen. The Atlas late date had been 9/20/1992, Norfolk, B. Cassie. It is obvious that the recent "last sightings" are much later than Scudder’s “last of September." Last sightings have been in October in seven of the 23 years under review. The tail of the flight period appears to be extended. Also the second brood appears today to be more abundant than the first brood, rather than the reverse. Both these differences may be effects of climate warming. However, Tawny-edged has a wide continental distribution and is seemingly adaptable to a range of latitudes and host grasses. It already has two broods here; the possibility of a third should be investigated. It may not be negatively affected by climate warming in our area (Table 6). Its NatureServe (2010) status is S5 or secure, in Massachusetts, Connecticut, New York, and Maine, and S4 in Vermont and New Hampshire.